This is the first module built according to the T-Trak for Trolleys designs by Rich Kerr from the East Penn Traction Club. These use Tomix 140mm radius mini curves. 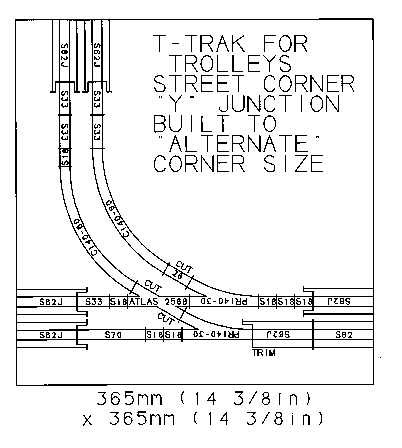 This allows a double track junction to be built in the same area as a regular Alternate spaced corner. Note that SD70s will NOT go around these curves, but have no problem going through the points if they are set for the straight. Kato's standard track spacing is 33mm (this is the T-Trak Alternate spacing) and Tomix's is 37mm. Tomix make a 33mm straight, however, so the two track systems can be mixed if the module includes at least one 90 degree curve. The Unitrack Snap-Track adapter is actually a Kato to Tomix converter. Atlas Snap-Track doesn't need the converter - it's just that Kato don't like to mention the name of their biggest competitor. The scenery on this module includes a power substation and high voltage transmission tower, an industrial building, a garage belonging to a limousine service, a Nippon Express office (a Japanese equivalent to UPS or FedEx), and two small houses. The Kato industrial building was bought used for $5. The roof railings were broken, so they were rebuilt rebuilt them with styrene strips. The underground garage entrance is scratch built.